The Agilent/HP 53131A universal counter has the capability to do the job quickly and correctly from fast signal processing to automated limit tests. 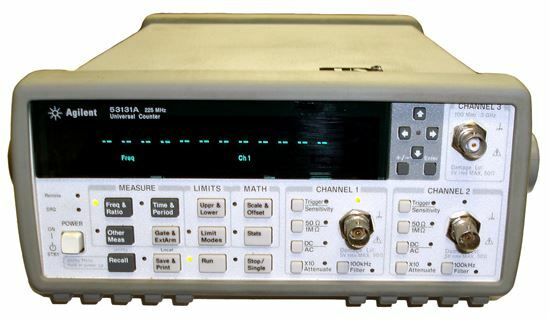 The Agilent 53131A has frequency resolution of 10 digits per second, 500 ps time interval resolution and a complete set of test and analysis features. The unit comes with two 225 MHz channels, and you can choose an optional third channel that measures up to 3 GHz, 5 GHz, or 12.4 GHz. Standard measurements include frequency, period, ratio, time interval, pulse width, rise/fall time, phase angle, duty cycle, totalize, and peak voltage. The Agilent/HP 53131A/132A/181A counters offer built-in statistics and math functions so you can scale measurements and simultaneously measure and track average, min/max and standard deviation. Automated limit testing lets you set upper and lower limits for any measurement. An analog display mode lets you see at a glance whether a measurement is within pass/fail limits. The counters flag out-of-limit conditions and can generate an output signal to trigger external devices when a limit is exceeded. For quick access to frequently used tests, a single keystroke recalls up to 20 different stored front panel set-ups. For computer-controlled systems applications, each 53131A counter includes a standard GPIB interface with full SCPI-compatible programmability and a data transfer rate of up to 200 fully formatted measurements per second. The standard RS-232 talk-only interface provides printer support or data transfer to a computer through a terminal-emulation program.